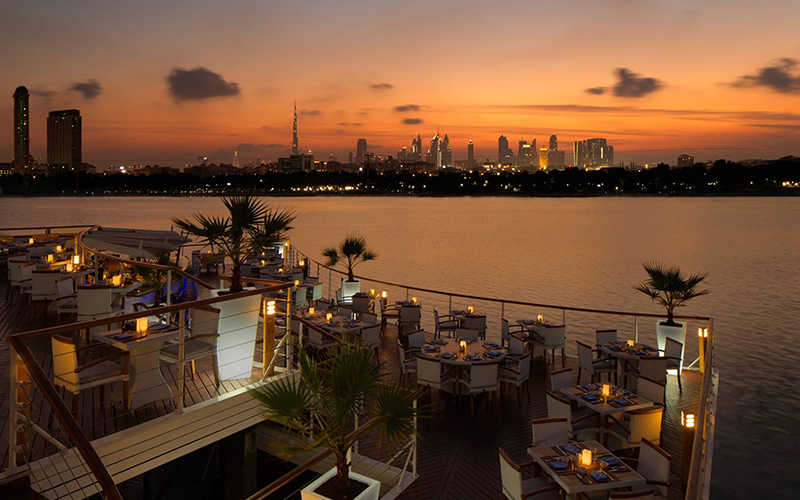 Situated on the top floor of the Dubai Creek Golf & Yacht club. Legends offers two brunches each Friday. One runs during the afternoon, and a second in the evening. Both packages offer the same options: buffet starters and desserts, with a la carte mains with table service, and free flow house drinks – offering bubbly at a premium. The a la carte menu sets this brunch apart from the bog-standard buffets offered across the city. Despite being a steakhouse the rest of the week, the brunch menu has plenty on offer for pescetarians and vegetarians. The pan-fried seabass, croquettes and grilled chicken were all standout dishes. Although there was a little wait on drinks service, overall the staff were great and food service was prompt. During the cooler months, the brunch spreads out over the restaurant’s roof top terrace with panoramic views of the Burj Khalifa, and Dubai Creek. During the summer, the brunch moves indoors (still with good views through the restaurant’s floor to ceiling windows). BBC Good Food Middle East visited during the evening, and the brunch was three quarters busy with both tables who had stayed on after the lunchtime brunch as well as evening diners. Details: During the summer, Legends is offering a brunch package which includes free access to the club’s swimming pool and mini golf course. Daytime brunch runs from 12noon-3.30pm, while the evening brunch package runs from 7pm-10.30pm. Happy hour runs daily from 3.30pm-5.30pm. Prices: AED 175 for food and soft drinks, AED 255 for food and house beverages and AED 345 for food and bubbly. Children under seven dine free, children 7-12 years AED 55. For more information visit Dubai Creek Golf and Yacht Club.